Last Logged on 2019-03-25 19:15:33. Jose is a registered chessvariants.com member. I live in Ontario, Canada. I learned how to play Orthodox Chess in Puerto Rico in 1977. After growing tired of studying Chess Openings, I finally decided to start playing Chess Variants in 2004. I first got interested in Fischer Random Chess after reading an article on setting up Fischerandom starting positions in the March 2004 issue of USCF' Chess Life magazine. 4 years later, while on vacation in Puerto Rico on February 9, 2008 (playing FRC with some friends) I was introduced to the 9x9 Puertorican chess variant: "Modern Chess"; created by Gabriel Maura in 1968. I made a Game Courier preset for Modern Chess, and in March of 2008, I created by first ever chess variant: Modern Random Chess (MRC), based on a merge of concepts from Maura's Modern Chess and Fischer Random Chess. I also proposed Prime Ministers Chess (a 9x8 adaptation of Modern Chess) and created the variants Contemporary Modern Chess (CMC) and Prime Ministers Random Chess (PMRC) which are 8x8 and 9x8 adaptations respectively of Modern Random Chess; as well as Modern Capablanca Random Chess a 10x8 random version of the great Jose Raul Capablanca's game with the four 'Modern' Chess Principles. On December 2008, I invented Courier Chess Moderno; followed in the summer of 2009 by: Mini Courier Chess Moderno, Silver Elephant Chess and Modern Ministers Courier Chess. 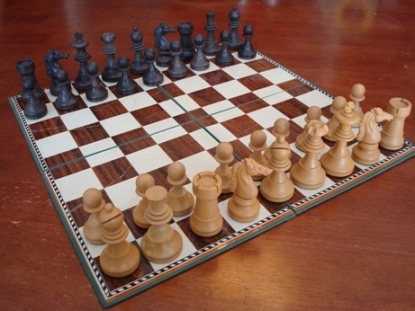 Later in 2009 I created the Ajax Chess complex of variants, and Korean Random Chess. In 2015 I re-engineered two ancient Roman and Greek games, and created Latrunculi XXI and Petteia XXI. I've also made some Checkers Variants presets, and a Makruk (Thai Chess) preset and information page. For citational purposes, we keep records on anyone who contributes content to this site. Since Jose Carrillo has contributed content to this site, our database listing on j_carrillo_vii needs to stay up. But if this person is dead or no longer interested in remaining active on this site, let us know, and this account can be made inactive.